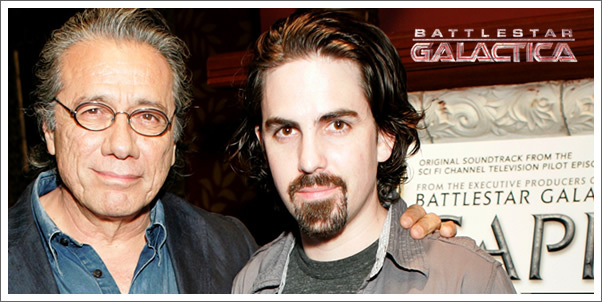 Burbank, CA – July 28, 2009– Universal Cable Productions presented Bear McCreary and the music from Battlestar Galactica for three nights at the House of Blues in San Diego from July 23-25th – during Comic-Con! Each of the nights was hosted by and featured appearances by members of the cast of Battlestar Galactica. The concerts celebrated the July 28 release of a special 2-CD set, Battlestar Galactica: Season 4, which reached the top 10 on Amazon’s Best Seller list for overall music sales, peaking at #4 and debuts at #195 on the Billboard Top 200. La-La Land Records is releasing the Battlestar Galactica: Season 4 soundtrack through a license agreement with NBC Universal Television, DVD, Music and Consumer Products Group. Featuring a cast reunion on stage with a touching tribute to producer Harvey Frand, who recently passed away, Friday’s concert was a must-see event. Joining Edward James Olmos (Admiral Adama) and Grace Park (Sharon ‘Boomer’ Valerii) – the evening’s emcees – on-stage were Richard Hatch (Tom Zarek), Michael Hogan (Colonel Tigh), Michael Trucco (Samuel Anders), Nicki Clyne (Crewman Specialist Cally Henderson), Michelle Forbes (Admiral Helen Cain), James Callis (Gaius Baltar), and executive producer David Eick. 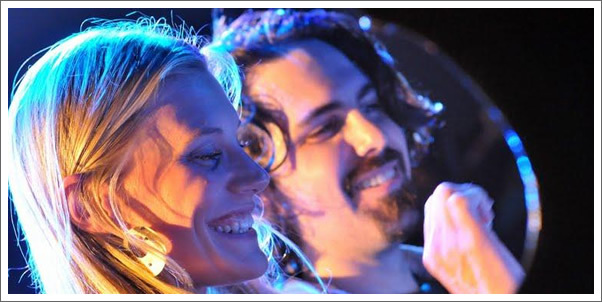 "Bear McCreary’s music was an integral part of the re-invention of Battlestar Galactica. Its complexity, depth, and breadth helped elevate the series beyond a simple ‘Space Opera.’ Seeing Bear play his music at the House of Blues, and having it serve as an impromptu tribute to Harvey, was a real honor," said Mark Stern, EVP, Original Programming, Syfy and Co-Head, Original Content, Universal Cable Productions. The emcee the first two nights, Edward James Olmos agrees. “The day has finally come when I will be able to experience live the sights and sounds of Bear and his friends. Wow.... what a privilege!" Season 4 composer McCreary was recently called one of the top 10 composers “that make space adventures epic” by www.io9.com. His work on the television series Battlestar Galactica has been described as offering “some of the most innovative music on TV today,” by Variety, and his blog www.bearmccreary.com/blog, which features in-depth inside looks at the process of scoring Battlestar Galactica, was called "one of the best blogs in the business. It's a fascinating look at the process of making music for film and television and the care he takes with aligning the score with the twists and turns of each character's plot lines," by The Hollywood Reporter. McCreary’s feature film credits include Wrong Turn 2 and the Rest Stop films. He also scores the series Eureka and Terminator: The Sarah Connor Chronicles and will be scoring the upcoming Syfy series, and Battlestar Galactica prequel, Caprica and the Capcom video game Dark Void. McCreary was among a handful of select protégés of late film music legend Elmer Bernstein and is a classically trained composer with degrees in Composition and Recording Arts from the prestigious USC Thornton School of Music.